A woman has been killed and one man injured in a Palestinian rocket attack on the southern Israeli town of Sderot. Police say six fell in and around Sderot, near the Gaza border. Later, militants fired at least three on Ashkelon, with no casualties reported. The Israeli army has been carrying out raids in the Gaza Strip intended to stop such attacks. Prime Minister Ehud Olmert has ordered retaliation following the latest rocket fire, AFP news agency reports. "The prime minister sees the attack as extremely serious," spokeswoman Miri Eisin told reporters. The announcement came as the UN Human Rights Council condemned Israel for an off-course artillery strike in Gaza last week, which killed 19 Palestinian civilians. In a special session, the council voted to send a fact-finding mission to the scene of the attack, the town of Beit Hanoun. An Israeli military investigation has blamed technical failures for the deaths. Sderot's western edge lies less than a kilometre from the Gaza border. The 57-year-old woman who died in the rocket strike was taken to Barzilai hospital in Ashkelon, where she succumbed to her wounds, medical officials said. A man in his 20s was seriously wounded. There have been several claims of responsibility, including one from the armed wing of the governing Hamas militant group. It said the attack was a response to the deaths in Beit Hanoun. "These organisations will pay a heavy price," the Israeli defence minister said. "We will move against those who are involved in the firing of rockets, starting from their leaders and down to the last of their terrorists," Mr Peretz added. Sderot is Mr Peretz's home town, and the injured man is a member of a private security firm that guards his residence there. Meanwhile, Palestinian leader Mahmoud Abbas has held talks with Egyptian President Hosni Mubarak in Cairo over efforts to form a unity government between his Fatah party and Hamas. Representatives of the international Quartet group also began a meeting in the Egyptian capital in an effort to revive the Israeli-Palestinians peace process. Qassam rockets are fired into Israel from Gaza by Palestinian militants on a daily basis. They rarely cause death or serious injury, but do cause fear and panic. In all, nine people, all civilians, are thought to have been killed in Israel by Qassam rockets since the first fatalities in June 2004. 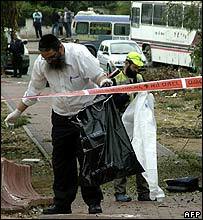 The last time someone was confirmed to have been killed inside Israel by Palestinian rocket fire was in July 2005. Israel cites the threat from Qassam rockets as the main reason for its military operations in the Gaza Strip. Almost 400 Palestinians, many of them civilians, have died in such operations since late June 2006. The UN's chief human rights official, Louise Arbour, says she will visit Israel and the Palestinian territories next week to examine the current situation facing civilians. She will hold talks with the authorities on both sides, as well as with human rights groups.